September 15, 2014 - Make sure you like EcoJoes on Facebook to stay updated on green ways to save money and help the environment. Just click the "like" button below. Muchas gracias! 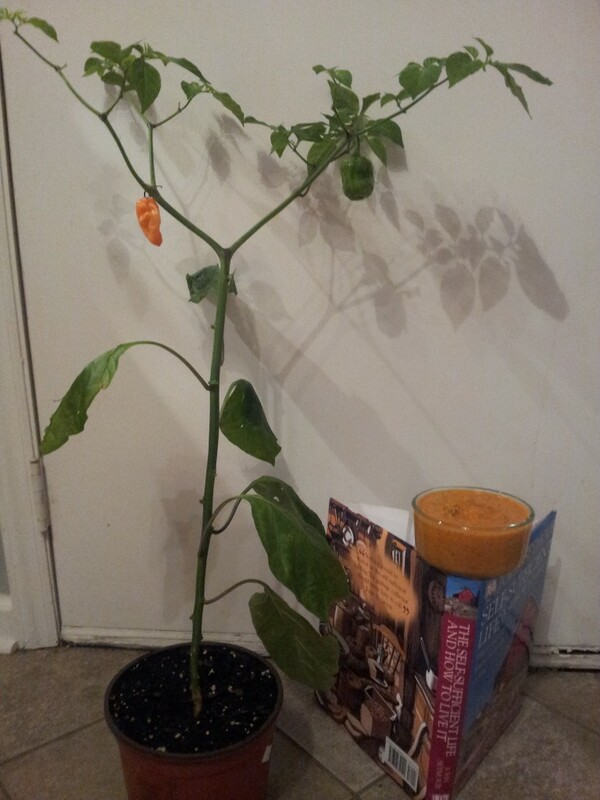 Have a heap of homegrown habaneros? Perplexed about what to do with these powerful peppers? Tired of just eating them whole until you pass out? 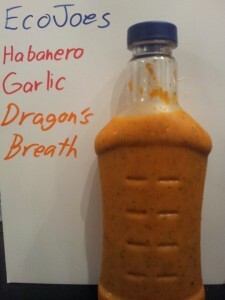 Here’s how to make some spicy-as-heck, so-good-you-slap-yo-mama homemade habanero garlic hot sauce. WARNING! Make sure you wash your hands with soap afterwards, and wash anything that touches the habaneros. Otherwise you’ll get some surprise burns later on, in some surprising places. Feel free to reuse a container to bottle this potent potable. EcoJoes-brand blessing, available via email for only $5! 1. 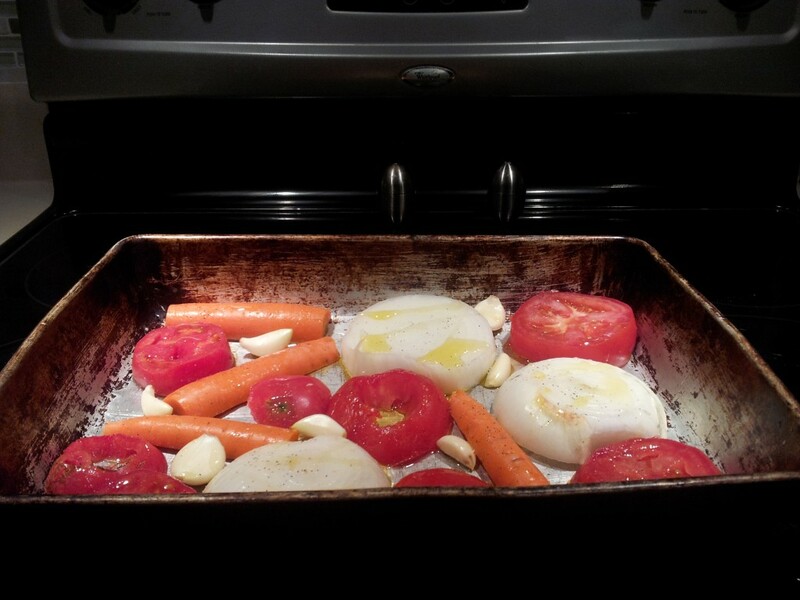 Use your trusty knife and slice the carrot, onion, and tomatoes into big ol’ chunks. 2. Put them and the garlic cloves in a pan, drizzle them with the olive oil, and roast these puppies at 425 degrees (Fahrenheit, or Celsius if that’s your style) for about 15 minutes. Take this time to get all those vegetable scraps and chuck ’em in the compost, or to reflect on your day. 3. 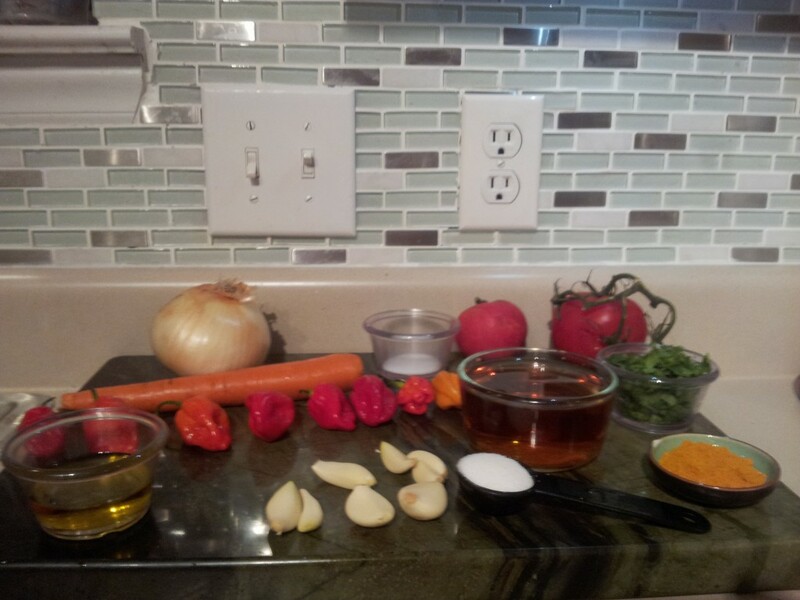 Plop the roasted vegetables into a blender or food processor along with all the other ingredients. Blend ’til you can’t blend no mo’… and then blend a little bit more. This is pretty dang spicy, and has endless uses! Slather it on steak, chuck it on chicken, use it as a decongestant, etc., etc. Let me know any variations on how you make this recipe! Posted in food	on Monday, September 15th, 2014 at 9:16 PM. Dag, that looks super awesome. Very well done. I bet Max would love that for Christmas. I bet he would! I just rolled out batch #2, with ginger and more garlic. "That's a spicy meatball"
Consider it done. I just made batch #3, my favorite so far, with a secret ingredient (courage). Excellent results! AND if you want a different degree of heat, just use OTHER PEPPERS! The recipe befits ANY PEPPER! Sylvia, you right. You dead right. And you welcome. I am loving to eat this sauce with meal that is meant to enhance the taste of everything we eat. It sure was easy to make this sauce at home which is good in taste.